Facebook's IPO filing is reportedly imminent -- and rumors are swirling about how much the social network led by Mark Zuckerberg is is worth. NEW YORK (CNNMoney) -- Facebook's long-awaited IPO filing is imminent, according to several news reports. The Wall Street Journal kicked off the hoopla on Friday, citing anonymous sources who said that Facebook may file for an initial public offering as early as this Wednesday. The New York Times and CNBC echoed that with their own unnamed sources in articles posted late Tuesday, saying that the filing will land Wednesday. Facebook is seeking to raise up to $5 billion in its offering, they added. If that number is correct, Facebook would represent by far the largest global IPO ever by an Internet-focused company, according to data from Dealogic. Google's (GOOG, Fortune 500) $1.9 billion debut is currently the largest U.S. Internet IPO. But Facebook would still lag behind blockbuster U.S. IPOs like those from Visa (V, Fortune 500), which raised more than $19 billion in 2008, and General Motors (GM, Fortune 500), which raised $18 billion last year. 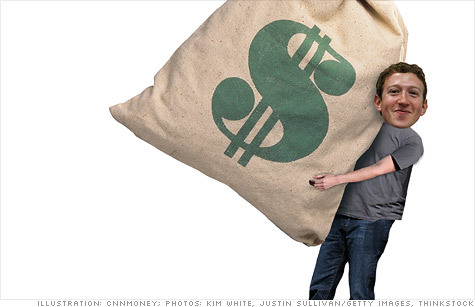 Facebook's IPO filing won't answer one burning question: What's the company worth? For that, Wall Street will have to wait until Facebook starts trading, which typically happens several months after companies file their first round of regulatory paperwork. Some experts have suggested that the social network could valued between $75 billion and $100 billion once it starts trading. No matter what the market cap, Facebook's IPO is undeniably hot, says Max Wolff, chief economist at GreenCrest Capital. But there's a lot more riding on Facebook's paperwork than wealth creation. The social network has become an entire ecosystem, supporting independent app makers and gaming platforms like Zynga (ZNGA). Facebook's filing will have implications for companies that depend on it, as well as the social media landscape at large. Until then, analysts are left to speculate about Facebook's revenue streams and profitability -- and whether it really deserves a $100 billion market value. Michael Pachter, a research analyst at Wedbush Securities, says the rumored valuation range is reasonable -- though he won't cite a specific estimate of his own. How Facebook makes money -- and could make more: The vast majority of Facebook's revenue comes from advertising: a combination of search and display ads. And the sales growth is incredibly robust. Research firm eMarketer estimated last September that Facebook's ad revenue would more than double in 2011 to $3.8 billion and increase another 52% to $5.78 billion in 2012. Facebook has grown by grabbing market share from Google and Yahoo. Last year Facebook comprised 16.3% of the so-called display (i.e. banners and other graphical ads) market, eMarketer estimates -- compared with Yahoo's (YHOO, Fortune 500) 13.1% and Google's (GOOG, Fortune 500) 9.3%. Martin Pyykkonen, analyst at Wedge Partners, says Facebook is highly appealing to advertisers because about two-thirds of its users fall into the coveted age demographic of 18-49. He thinks Facebook's ad targeting will become even more effective over time. "The 'Like' button option is a basic example of targeting," Pyykkonen wrote in a note to clients Monday. "[It's] likely that advertisers will be able to even better target their audiences as Facebook goes deeper with integrating apps, games, movies, music." Facebook's other revenue stream is its payment system for purchases within apps and games: Facebook Credits. Facebook keeps 30% of the revenue from those payments, and passes the remaining 70% on to the app developer. Facebook Credits now comprises 10% of the company's total revenue, up from 5% in early 2010, Pyykkonen estimates. Those estimates will soon be backed up -- or refuted -- by hard numbers from Facebook. Once its IPO filing does finally land, it will help answer questions about the overall social media market. "People are extrapolating outcomes into an environment that's hungry for missing details," said Wolff. "It's like all the guys in the class spreading rumors about the prettiest girl in the school." -- CNNMoney's Maureen Farrell contributed reporting.